TECHART presents several World Premieres for Porsche vehicles at the 87th Geneva International Motor Show. With six exhibition vehicles, TECHART demonstrates in Hall 2, how versatile and exclusive the individualization of Porsche models is done since 30 years. TECHART presents the preview of the new GrandGT based on the Porsche Panamera Turbo (MY 2017) that will be available as of mid 2017. The widebody exterior design with 80 mm increased width and its dynamic lines, gives the new Porsche Panamera a distinctive appearance. The Grand GT aerokit consists of a new front apron with integrated splitter, airframes and central air outlet, side skirts, extended wheel arches and a new rear apron with rear diffusor. The TECHART GrandGT comes with 22-inch TECHART alloy wheels equipped with 285/30 ZR22 and 335/25 ZR22 Conti Sport Contact 6 tires. The sport exhaust system with valve control and four central carbon fiber tailpipes, acoustically underlines the sportiness of this high-performance limousine. 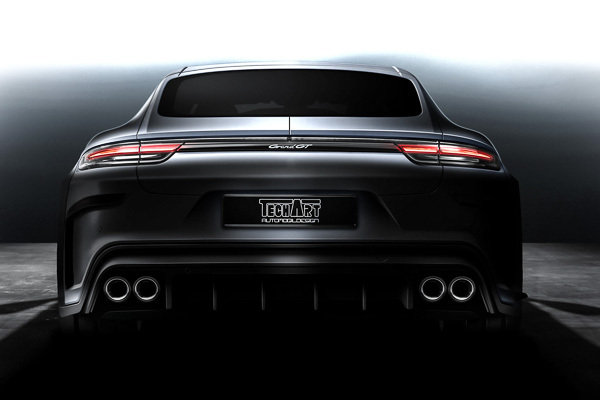 A new TECHART powerkit will boost the road performance of the new Porsche Panamera. The TECHART Interior Manufactory provides finest materials and best built quality like from the factory to make the GrandGT as individual as possible. The TECHART GTstreet R is now also available based on the Porsche 911 Turbo/S Cabriolet. With its breathtaking design, up to 720 hp and two different manufactory interiors, it represents the ideal symbiosis of outstanding performance and unrestricted suitability for daily use. The numerous carbon fiber aerodynamic bodyparts combined with the 265 mm and 325 mm wide Michelin Pilot Sport Cup 2 (alternative Michelin Pilot Super Sport) tires, optimize the road handling of the TECHART GTstreet R noticeably. The TECHART Noselift provides 60 mm of additional ground clearance at the front axle at the push of a button. The high performance sport exhaust system with continuously variable pneumatic valve control and four central tailpipes, releases the exhaust fumes while generating an extraordinary and powerful soundscape. If the customer orders the TA 091/T2.1 powerkit, a total of 720 hp (920 Nm) accelerate the GTstreet R from 0 to 100 km/h in only 2.7 s, from 0 to 200 km/h in 8.5 s and from 0 to 300 km/h in 23.3 s. At 340 km/h the GTstreet R reaches its top track speed. When it comes to the interior, a “Clubsport“ and an “Exclusive“ version with matching GTstreet R design is available from the TECHART Interior Manufactory.